The Darke County Steam Threshers held its 59th annual reunion Thursday through Sunday at York Woods. 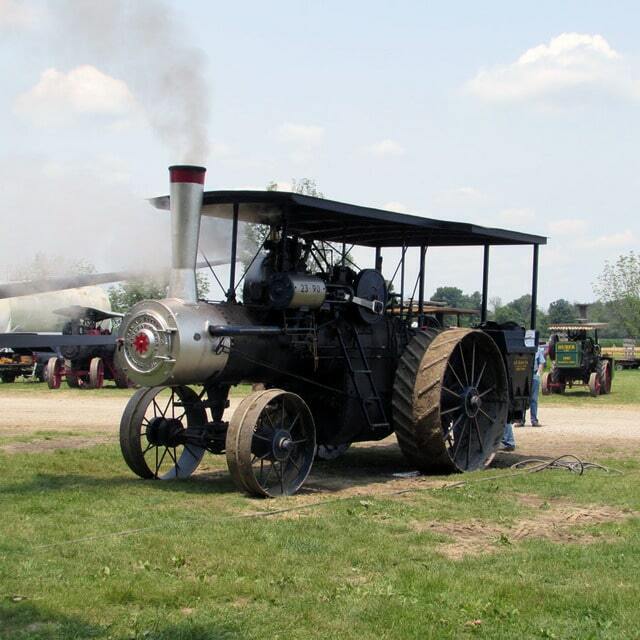 DARKE COUNTY — Tractor and steam power enthusiasts of all ages gathered at York Woods for the 59th annual reunion of the Darke County Steam Threshers Association, held Thursday through Sunday. The event has been held annually since 1956. Gibson estimated that approximately 2,000 to 3,000 people had walked through the entrance since Thursday’s opening. Gibson said this year’s gathering featured about 20 steam engines, 50 tractors, 30 gas engines, plus an untold number of garden tractors. For young eventgoers, the Steam Threshers staged a kiddie tractor pull and allowed children to use scale-model steam engines to slice watermelons, among other activities. Vendors were on hand, selling food, crafts, farm equipment, and die-cast tractors, among other items. A steam-powered calliope, wood sawing and threshing demonstrations entertained eventgoers throughout the festival. Upcoming events for the association include the 127 Garage Sale held August 6-9 and the Massacre Mill Haunted Woods from September 25 to October 31. For more information on the Steam Threshers, visit its website at www.darkecountysteam.com.